I’ve noticed whole peony bushes in bloom around town. Mine are slowly making their way open and I can hardly wait to put my nose down in their soft petals to take a good long whiff of their aroma. 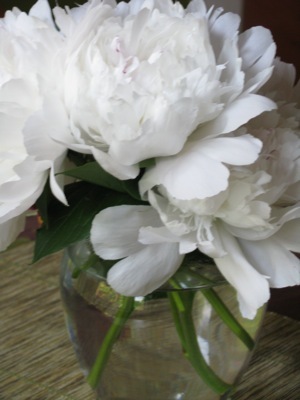 Today seems to be the perfect day to share Mary Oliver’s exquisite poem called “Peonies”. Enjoy! -“Peonies” from Mary Oliver, New and Selected Poems (Beacon Press). This entry was posted in life's simple pleasures, new awareness, Uncategorized. Bookmark the permalink. Both comments and trackbacks are currently closed.